A properly written Bio is the single most important thing you can have for an optimized Twitter account. A bio is important because it is the first thing a Twitter follower reads about you. If they don’t know who you are, this is their first introduction. All of the information must be filled in. It is important that you tell the reader everything about your company on your bio. The trick is to do it in the allotted amount of characters! Not only that, but keywords for your industry are crucial as well as hashtags. 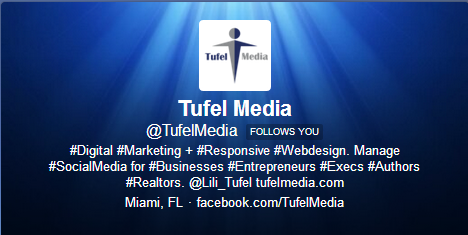 Tufel Media can optimize your Twitter bio with the proper keywords, hashtags and links! This is important so that your company can be seen in Twitter searches. Twitter users sometime search for stuff. They search keywords and hashtags. It is imperative that your Twitter profile be optimized for your company to show up in their search results. When your company appears in a person’s search and he or she clicks on your Twitter profile, your most important links should be readily available to that person. Not many people know that you can add two links to a Twitter profile. You can add your website link on the line underneath your bio. You’ll find the place to add your website in your settings. What many people don’t know is that they can also add a link inside the bio. Here is an opportunity to add two links to your Twitter profile which can possibly take the reader to a landing page with a call to action. Remember, Tufel Media can take care of all of this for you.